By allowing companies in Missouri to contract directly with third-party suppliers of renewable energy, as they are able to do in many other states, and raising the state’s unusually low cap on the size of installations that qualify for net metering, Missouri can unleash its renewable energy potential and drive private investment, job creation, and economic growth. That is the primary finding of this policy brief, based on analysis by Meister Consultants Group for AEE. Many well-known companies such as 3M, Cargill, Dow, General Mills, GM, Ikea, Microsoft, Nestle, Nike, Proctor & Gamble, Sprint, Unilever, and Walmart have a presence in Missouri. 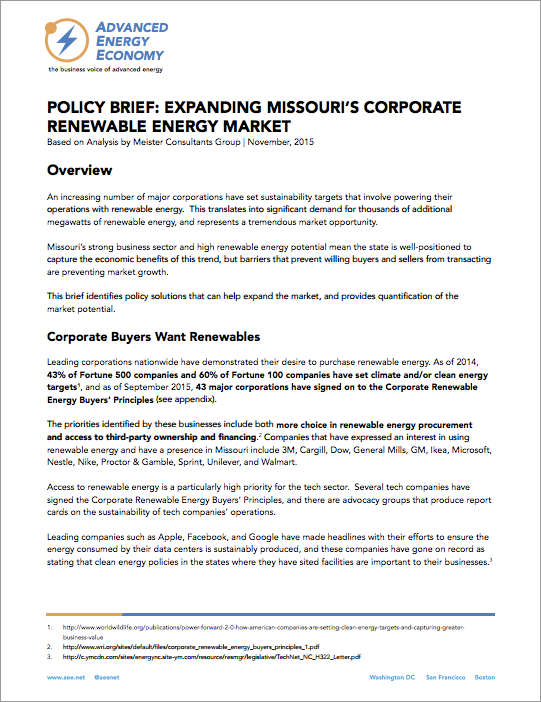 These companies have also expressed an interest in renewable energy as part of their corporate sustainability goals, yet Missouri's current policy framework blocks its biggest corporate citizens from procuring renewable energy and helping to grow the state's renewable energy market. This policy brief recommends simple policy changes that could significantly expand private investment in the state. Please fill out the form to download the policy brief.